- The bulk of the Serbian army has managed to keep one step ahead of its pursuers, reaching Mitrovica and Priština. 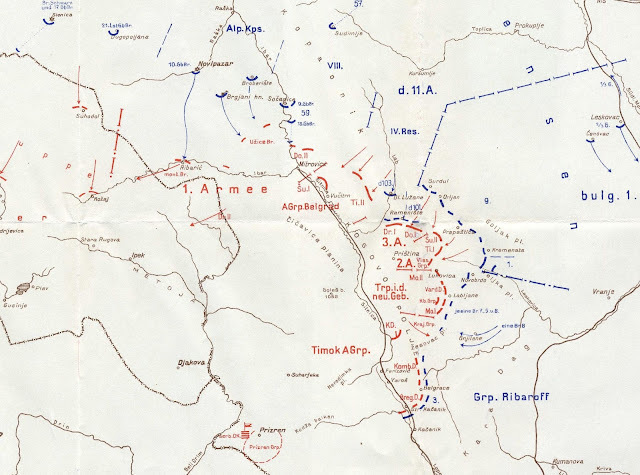 Poor weather, rough terrain, and few roads have slowed the pace of the German and Austro-Hungarian advance, though the same conditions have of course made things miserable for the Serbs as well. Aware that the Germans have withdrawn some of their divisions from Serbia, some generals wish to make a last stand in Kosovo, just as their forebearers had done versus the Ottomans in 1389. General Putnik, however, has a more realistic assessment, understanding that the forces remaining under his command are hardly fit for further major battles. Instead, Putnik, with the agreement of the king and government, issues orders today to abandon Kosovo and retreat from Serbia altogether. They will cross the high mountains of Albania towards the Adriatic ports of Scutari, Durazzo, and Alessio, hoping that their Entente allies can evacuate them to a place where they can rest and recover from the past two devastating months. The front in Serbia, November 22nd, 1915. - Between 11am and late afternoon elements of the Italian 2nd Army attack the Austro-Hungarian lines on the heights of Podgora, but have no more success than they had achieved over the last two days. On 3rd Army's front slight progress is made towards St. Martino, though some of the ground gained is lost to counterattacks after nightfall.